New York Red Bulls II put on a scoring clinic as they defeated the Tampa Bay Rowdies, 5-0, on Saturday at Red Bull Arena. NYRB II stayed perfect at Red Bull Arena, improving to 3-0-0. 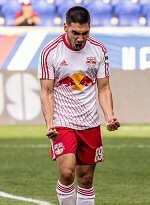 Red Bulls II have outscored their opponents, 12-3, at home this season. Red Bulls II opened the scoring off a corner kick in the 18th minute via New York's first team loanees. Carlos Rivas took possession of the corner kick and swung it back in for Fidel Escobar, who finished near post in the 18th minute. Holding onto a 1-0 lead into the second half, Ethan Kutler sent a through ball into the 18-yard box for Stefano Bonomo, who passed back to Jose Aguinaga at the top of the box. Aguinaga hit a perfect one-timer that curled to the far post to double the lead in the 53rd minute. Bonomo then got himself on the scoresheet as he sent his shot just underneath the crossbar in the 61st minute for his first of the season. MLS SuperDraft first rounder Brian White came on in the 74th minute for Rivas and bagged a brace in a six-minute span to cap the match off. Evan Louro tallied a game-best two saves for his first clean sheet of the season.